Urine is made in the kidneys. Humans have two kidneys, each of which passes urine to the bladder by a tube called the ureter. This tube can become blocked for a number of reasons (e.g. kidney stones or cancer). A blocked ureter can stop the kidney from working properly and can damage the kidney. Also, if the urine that is blocked becomes infected, it can cause serious illness. A nephrostomy is an opening between the kidney and the skin. A nephrostomy tube is a thin plastic tube that is passed from the back, through the skin and then through the kidney, to the point where the urine collects. Its job is to temporarily drain the urine that is blocked. This allows the kidney to function properly and protects it from further damage. It also helps clear any infection. Ultrasound and/or X-ray images (or pictures) are used to guide the procedure. 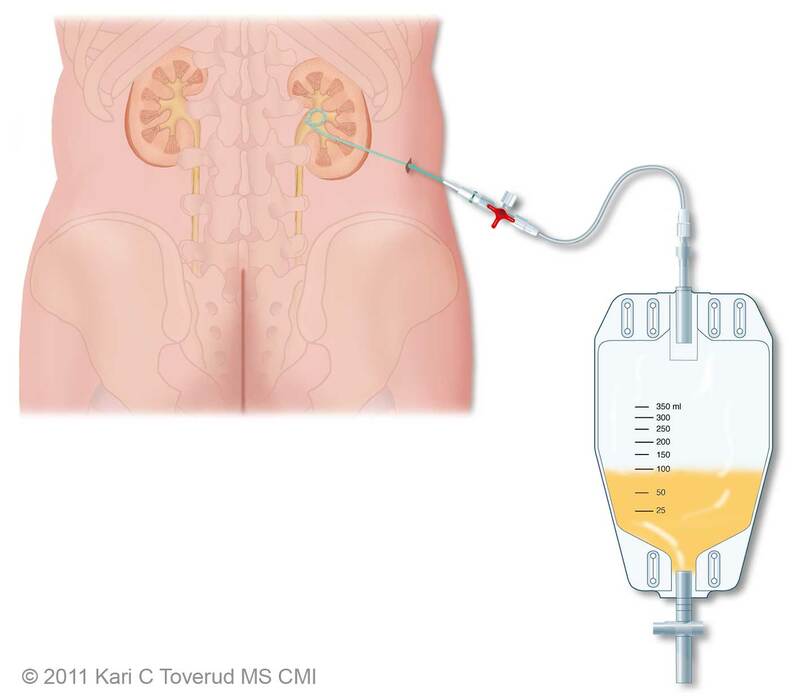 Contrast is injected into the part of the kidney that collects the urine. This enables the tube that will drain the kidney to be inserted into the collecting system in the best position. How do I prepare for a nephrostomy? Apart from fasting (going without food and water) before the procedure, there is no specific preparation for a nephrostomy. previous kidney or bladder surgery. Also, bring with you any X-rays, CT scans, ultrasounds or MRI scans. This information helps plan the procedure and will help medical staff to prevent complications. Occasionally, other tests (e.g., blood tests) may be required before proceeding. Your referring doctor or the hospital where you are having the test will discuss this with you and arrange any tests or scans you need before having the nephrostomy. Again, this is to try to prevent complications. What happens during a nephrostomy? When you will arrive in the radiology your details will be confirmed and the radiologist will discuss the procedure with you. Be sure to ask any questions or voice any concerns. At this time, you will complete a consent form, if this has not already occurred. An intravenous cannula or ‘drip’ (a thin plastic tube) will be inserted in your hand or arm. Almost all nephrostomy tubes are inserted under sedation (to make you very sleepy) or general anaesthesic. If you have any concerns about this, please talk to the medical staff and let them know your concerns. The procedure is carried out while you are lying on a special X-ray bed on your stomach or slightly on your side. This allows the radiologist access to your kidney. The area will be cleaned and sterile drapes placed over you. Your sedation and pain relief will normally be injected at this time. The radiologist will choose the position for the nephrostomy and inject the local anaesthetic. A small nick is made in the skin. The radiologist will then use ultrasound and/or X-rays to guide a very thin needle though the skin to the correct position. The position will be confirmed with an injection of contrast medium. If there is any concern of infection, a specimen of urine will be sent for analysis. Once the position is confirmed, a wire is placed through the needle and the needle is removed. The nephrostomy tube is inserted over the wire. The wire is removed and the tube is ‘locked’ in position by pulling and fastening a string that causes the end to curl into what is called a ‘pig-tail’ appearance. This helps keep the nephrostomy in position. The final position is confirmed with a second injection of contrast medium. The nephrostomy is then fixed to the skin surface by a combination of dressings, plastic clips and/or stitches. Finally, a drainage bag is connected to the nephrostomy to collect the urine and the procedure is finished. Once the reason for the nephrostomy has been treated, the nephrostomy can be removed by medical or nursing staff without further intervention. Sometimes, X-ray is used to guide the removal. If you require the nephrostomy for a longer time, the nephrostomy tube will need to be exchanged periodically . This is similar, but less involved, than the original insertion and can be carried out as a day procedure. Your referring doctor or the hospital where you are having the procedure carried out will need to give you information about the care required for a long-term nephrostomy. Are there any after effects of a nephrostomy? After the procedure, you may experience some pain and bruising at the site where the needle, wire and tubes are inserted. Your urine may also be blood stained. The bruising and blood stained urine usually clears in 1–2 days. If simple pain relief is not working or you feel that the blood staining is getting worse, you should immediately return to where you had the procedure carried out or to your referring doctor to ensure there are no complications developing, such as infection. How long does a nephrostomy take? Once the sterile preparation has been completed, it takes approximately 30 minutes to insert a nephrostomy. The length of the procedure can vary considerably, depending on each patient’s internal body structure and the reason for the nephrostomy. A longer procedure does not necessarily mean that there is a complication – the radiologist will be ensuring time is taken to place the nephrostomy safely. Most centres will require you to stay overnight after a nephrostomy insertion. What are the risks of a nephrostomy? There are recognised risks associated with a nephrostomy. Inserting a nephrostomy is a relatively safe procedure and the risk of serious complication is rare. allergic reaction to contrast injection – severe reactions occur in less than 1 in every 1000 patients (see iodine-containing contrast medium (ICCM)). A nephrostomy can help maintain kidney function and protect the kidney from damage and infection. A nephrostomy can also help to diagnose an underlying problem, because the injecting of contrast medium and using ultrasound and/or X-rays to image the ureter allows any abnormalities to be seen. A nephrostomy also allows access to treat any underlying problem. This may be carried out at the same time or at a later date. The vast majority of nephrostomies are carried out by radiologists or urologists (specialist doctors). Where is a nephrostomy done? Nephrostomies are carried out in the radiology department of a hospital, usually in the angiography/interventional radiology suite. This is similar to an operating theatre and contains all the required equipment for the procedure, including the X-ray and ultrasound machines. When can I expect the results of my nephrostomy? Provided that the nephrostomy continues to drain urine, your kidney function will be maintained and any infection can be treated with antibiotics. Usually, the success of the procedure will be virtually immediately after the insertion. Your doctor may discuss with you an alternative to nephrostomy called uretric stenting, which may be a preferred option in some circumstances.